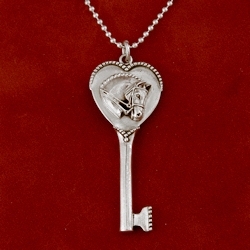 Sterling silver heart key with bead detailing and dressage horse head. Key length is 2 inches and heart measures 7/8″ wide. Room for engraving on the back. Sterling silver bead chain comes in 18 or 20 inch length. Longer chain at additional cost. Can come with most other mini heads. 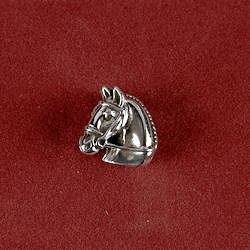 In stock with braided snaffle mini head as shown below. 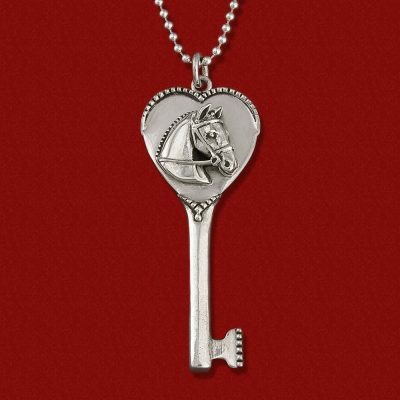 A trendy key design with a horsey touch! 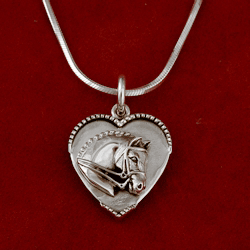 Sterling silver heart key with bead detailing and dressage horse head. Key length is 2″ and heart measures 7/8″ wide. Room for engraving on the back. Sterling silver bead chain comes in 18″ or 20″ length. Longer chain at additional cost. Trendy key design with a horsey touch!